With titles such as I would not have passed the anti-doping test or Shot at Dawn, Alan S. presents installations that speak of his life as a Guardsman in the Grenadier Guards and his experiences of homelessness. Alan S began making his expansive installations, intricate dot paintings and poetry whilst he was homeless and has continued to develop work over the last eight years. He intuitively combines collections of discarded, found materials often discovered around the city in skips, bins and charity shops, together with paint and words; conveying his own experience, memories and personal histories. 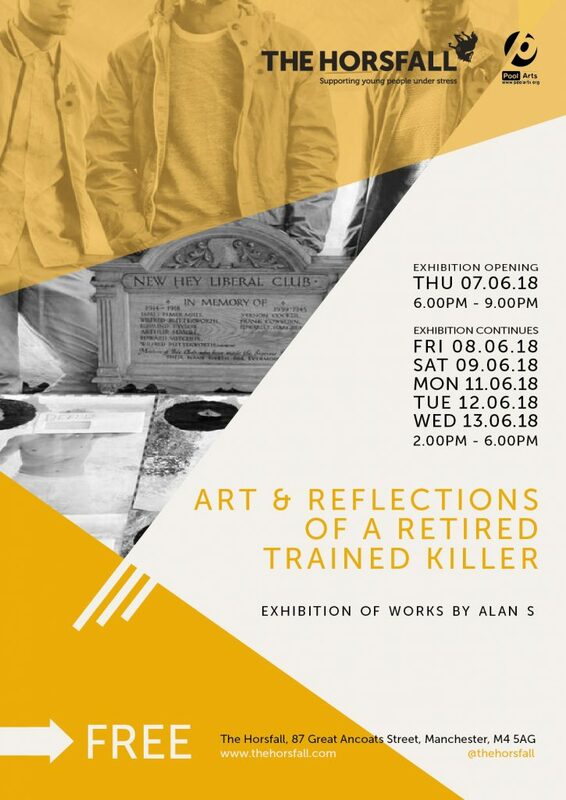 This exhibition stems from the 100 year anniversary of the First World War and explores the personal histories of Manchester based artist Alan S. It features two floors of large scale installation works using found objects and explores the line between humour and seriousness. With titles such as ‘I would not have passed the anti-doping test’ or ‘Shot at Dawn’, the installations explore his life as a Guardsman in the Grenadier Guards, his experiences of homelessness and his views on topical issues. This work is juxtaposed with painstakingly intricate dotwork pieces, each one taking over 50 hours to complete; a practice which the artist developed using accessible materials as a way to switch off and relax. Alan S began making expansive installations, intricate dot paintings and poetry whilst he was homeless and has continued to develop work over the last eight years. He intuitively combines collections of discarded, found materials , often discovered around the city in skips, bins and charity shops on his daily explorations through back streets and alleyways. He combines these with paint and words; conveying his own experiences and memories. Alan S’ exhibition is part of a wider partnership between The Horsfall and Pool Arts to showcase work which has been informed by the mental health of the artist or takes mental health and wellbeing as its central theme. 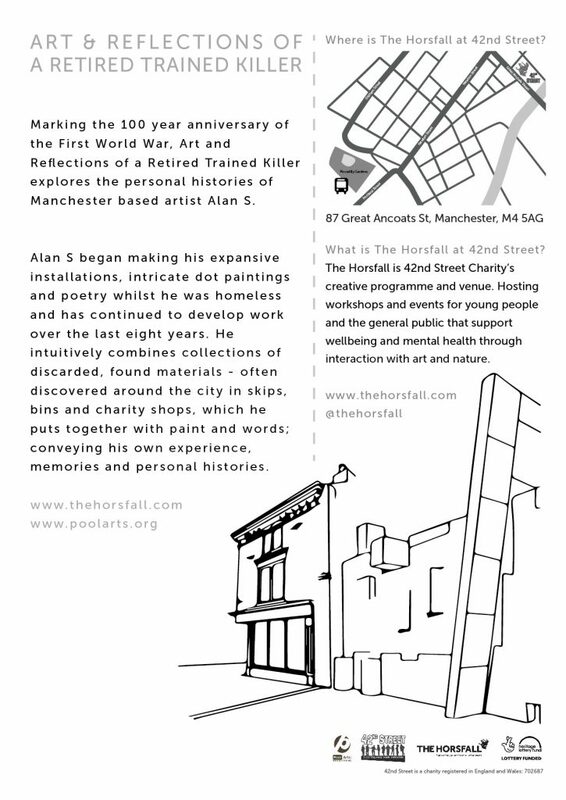 Alan S has spent over 10 years living and making work in manchester, from intricate dotwork pieces to large scale installations based on his personal experience as a Guardsman in the Grenadier Guards and his experiences of homelessness. His work covers serious topics but always conveys a sense of humour and fun. Initially creating work to ‘switch off’ and relax, he became a member of Pool arts 9 years ago and began exploring the larger scale, installation work whilst being a studio member of Hope Mill, continuing his practice at their studio in Ardwick. This exhibition is in association with Pool Arts; an artist led organisation which challenges the barriers that some artists face and aims to provide studio space, support, training, professional and personal development opportunities. They are working to create a supportive framework, giving their members opportunities to produce, promote and sell their own artwork, as well as raising awareness of the positive role that art and culture can play in the wellbeing of the community. Pool Arts now has studio space in Ardwick and welcomes new members. Please contact for further information. 42nd Street is a Greater Manchester mental health charity committed to supporting young people aged 11-25 years with their emotional well-being and mental health, promoting choice and creativity. With an excellent 35 year reputation, our unique holistic service model combines therapeutic psychological interventions with advocacy and social care. We reach 2000 young people each year via individual therapeutic support, projects and activities, leadership, peer research and a creative programme. The Horsfall is 42nd Street’s creative venue and programme dedicated to improving young people’s mental health and wellbeing. Projects, workshops and events sees artists from across all artforms co-creating work with young people to interrogate their own stories and to imagine new futures.